I/DEBUG   ( 5150): 400d3364 e3851001 ebffecbe e3500000 13856002  ..........P..`..
did it crash immediately? any special instruction for reproducing the crash? When I open it ,I saw a black screen with sprte title,then wait 5~10 seconds, it crash. 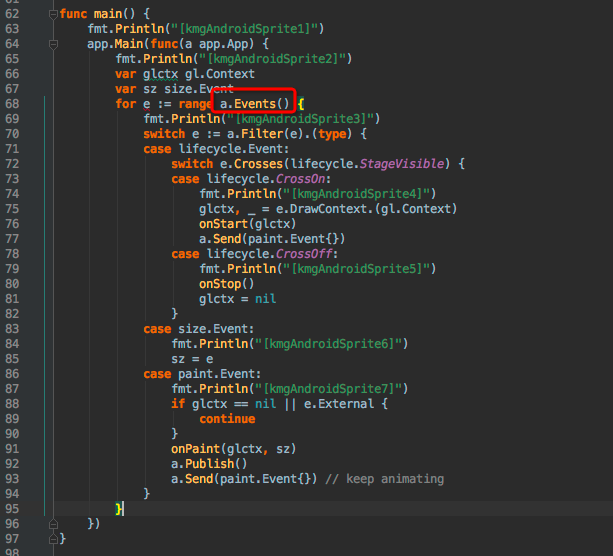 Are you using android-22(android v5.1) to compile your app and then running it on a phone which runs v4.0.4? Shouldn't that cause an issue? "Are you using android-22(android v5.1) to compile your app and then running it on a phone which runs v4.0.4? Shouldn't that cause an issue?" It works for binding and network interface with android-22 and that phone. How can I build a APK that works for android v4.0.4 with gomobile? Same error on Android 4.2.2 with go1.5.1. gomobile version - latest. E/InputDispatcher( 511): channel '41f17760 org.golang.todo.objloader/org.golang.app.GoNativeActivity (server)' ~ Channel is unrecoverably broken and will be disposed! Old versions gomobile and go1.5 worked on my device. UPDATE: upgrading to go1.5.2 doesn’t help. Is this still a problem with a recent version of gomobile?